KBB.com Brand Image Awards. This Honda Ridgeline delivers a Gas V6 3.5L/212 engine powering this Automatic transmission. XM satellite radio w/3-month subscription, Vehicle Stability Assist (VSA) w/traction control, Variable-assist pwr rack & pinion steering. 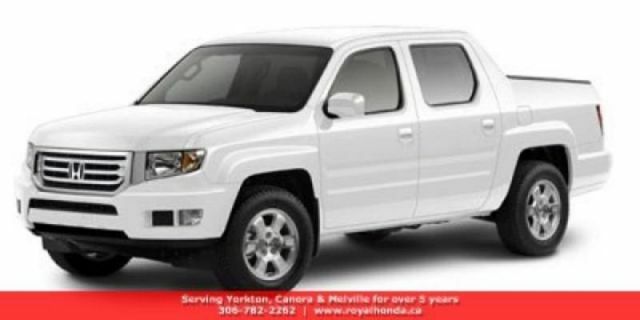 * This Honda Ridgeline Features the Following Options *Variable Torque Management 4-wheel drive system (VTM-4), Variable intermittent windshield wipers w/auto heated wiper zone, Trip Computer, Tire pressure monitoring system -inc: location indicators, Tilt steering column, T165/90R17 spare tire, Steering wheel-mounted cruise controls, Steel-reinforced composite (SRC) bed -inc: 60 bed length, in-bed trunk, dual-action tailgate, Security system, Remote entry system. * Visit Us Today *Treat yourself- stop by Royal Honda located at 71 Dracup St, Yorkton, SK S3N3P9 to make this car yours today!